Quite the contrary– as a matter of fact, I would suggest you bring enough Red Bull to keep you going for at least a week. After a recent 4 day visit, we had only scratched the surface exploring Polk County’s numerous offerings, which greatly surprised me since when I checked both Fodor’s and Frommer’s 2009 Florida guidebooks there wasn’t a single mention of the area. Not a word about the gorgeous lakes, scenic towns or unique activities…guess they were all too busy shaking Mickey’s hand or something??? Geographically, P.C. is located in the bulls-eye of Florida, and less than an hour’s drive to Tampa or Orlando, so it would make a perfect home base for visiting the Disney theme parks and the lesser known delights in the central area. It’s a beautiful region with many gardens, preserved birding areas, fragrant citrus groves and 550+ lakes, offering all the water sports and world-class bass fishing. One of the Sunshine State’s crown jewels, this small city charmer is best explored by walking the historic streets lined with antique stores, sophisticated art galleries, and boutiques, cafes, parks and outdoor sculptures, in other words, a superb choice for a Girlfriend Getaway. 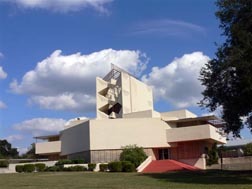 I was awestruck as we drove through the campus of Florida Southern College, home to the world’s largest collection of buildings by the visionary architect, Frank Lloyd Wright. When Wright first toured the orange grove area, at age 67, he envisioned buildings rising “out of the ground, into the light and into the sun.” His master plan called for 18 buildings, (although he ended up building only 12 which he described as the “Child of the Sun”) using the following basic materials: steel for strength; sand because it was native to Florida; and glass to bring God’s outdoors into man’s indoors. Self-guided walking maps are available so you can tour at your own pace. Need to stretch your legs? 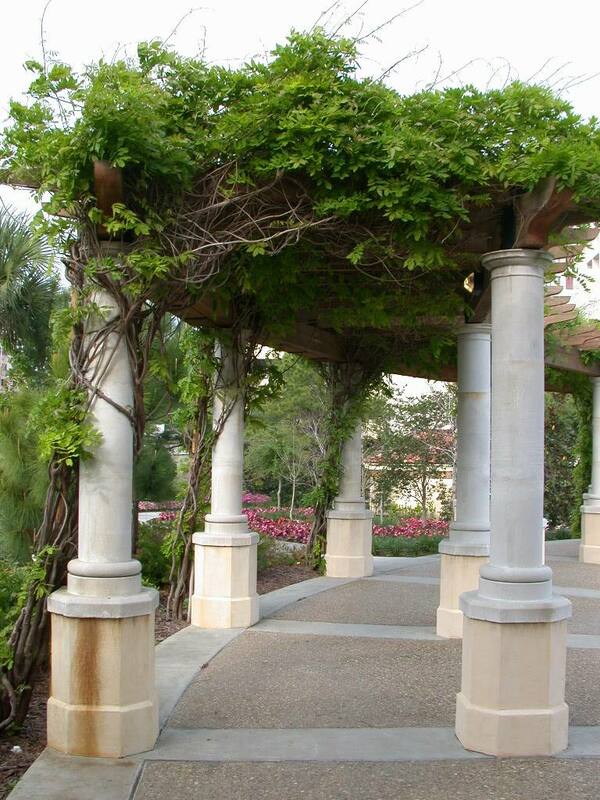 Take a three mile jog on the promenade surrounding downtown’s shimmering Lake Mirror or perhaps a leisure stroll around the 1.2 acre formal neo-classical Hollis Garden, located in Mirror Park. The garden features over 10,000 flowers and shrubs, a koi pond, bamboo, fountains, waterfalls, sculptures, and a beautiful lakeside view. The garden is aesthetically arranged in colorful “rooms” such as The Grotto, the Butterfly Garden, and The Vegetable Room to tell the story of Florida agriculture. Be sure and check out the amazing “Trees of Americana” which melds history and horticulture in a unique manner. All the trees in this room are grown from either seedlings or cuttings from a tree owned by a historic figure, such as Abe Lincoln, Helen Keller, Patrick Henry, and even Elvis. Free admission. A top hotel and dining choice would be the historic Terrace Hotel. This grand dame was built in 1924 as a year-round inn, quite unique in those days. A few years ago, millions were invested to restore her to her original beauty. 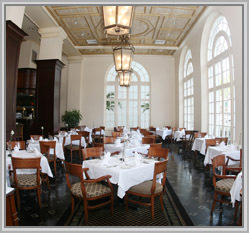 I appreciated the airy feeling provided by the high ceilings, nostalgic tile and wicker, and the elegant Terrace Grill’s large French windows which offered picture-perfect views of Mirror Lake while dining on Porcini Dusted Sea bass served with a hot Boursin cheese soufflé. History buffs and art lovers will enjoy the Polk Museum of Art, while theater-goers will want to take in a live performance at the Polk Theater, which began life in1928 as a great old vaudeville palace. For sport fans, the Detroit Tigers hold spring training camps in the area. Fantasy of Flight was voted Florida’s #1 BEST KEPT SECRET, which is just plain wrong-and on so many levels. I admit that I’m not a big aircraft fan (having experienced more Nightmares of Flights than I can count) and I was not really looking forward to visiting F.O.F. But three hours when it was time to move on to our next attraction, they had to literally drag me kicking and screaming from the cockpit of my Corsair fighter where I was mercilessly firing at the enemy troops. You could easily spend a whole day wandering through three huge hangers displaying the world’s largest privately owned collection of priceless vintage aircraft, most of which have been restored to their original flying condition. Founder Kermit Week’s goal in opening Fantasy of Flight was to completely immerse visitors in everything from man’s earliest attempts at flight to the role of aircraft in two World Wars. On our riveting guided tour, we boarded an authentic B-17 Flying Fortress where I actually got goosebumps listening to stories about the young soldiers sent on bombing missions in World War two. At one new multi-media exhibit you can listen to inspiring interviews with some of the original African-American Tuskegee Airmen. Another is devoted to honoring the WASP, the first women in history to fly U.S. military aircraft. Weather permitting, there are often aerial demonstrations where you’ll see these vintage aircraft in flight and have an opportunity to speak with the pilots. Or perhaps you’d prefer a ride in a real biplane or hot air balloon. 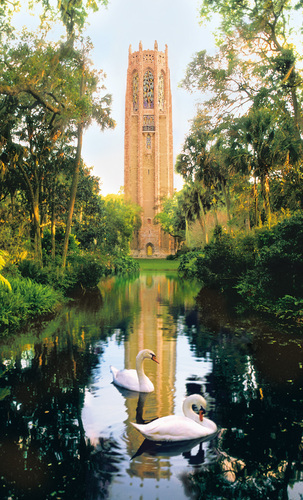 The gardens began in 1921 when Edward W. Bok, editor of the popular women’s magazine Ladies Home Journal decided to create a bird sanctuary on Florida’s highest hill–although coming from hilly San Francisco, here it would barely qualify as a road bump! Bok then hired famed landscape architect Frederick Law Olmsted, Jr. to transform what then nothing but a hill of sand into “a spot of beauty second to none in the country”. Considered one of America’s finest gardens, Bok is filled with thousands of colorful azaleas, magnolias, camellias, ferns, and trees as well as swans, ducks and over a hundred varieties of wild birds. Try and time your visit for a glorious afternoon bell recital at 1:00 and 3:00 PM. Tours are available of Pinewood Estate, one of the best examples of Mediterranean Revival architecture, also located on the grounds. Circle B Bar Reserve is a 1,297 acre preserve with a tremendous bird population,(over 250 species have been recorded) including a variety of wading birds, waterfowl, ospreys and bald eagles. On our tour we were lucky to spot a rare whooping crane, as well as a not so rare alligator. You might also catch a glimpse of wild boars, otters, snakes and turtles playing hide and go seek in the marshy swamps. Indoors, check out their new Nature Discovery Center, which offers a variety of nature-based activities, wildlife viewing platform, nature guided tours of the reserve, and several interactive exhibits that focus on the Green Swamp, water systems and central Florida lakes. Dude, for a complete change of pace and a good giddeyap, mosey over to Westgate River Ranch Resort. This authentic dude ranch lets you join in all sorts of cowboy fun– from horseback trail rides on their 1,700 acre ponderosa, to romantic hayrides, or shop “main street” at their wild west town. After a tasty BBQ dinner, you can head over to the saloon for some live music and line dancing. There’s a sanctioned rodeo every Saturday night in their 1,200-seat rodeo stadium, with bull riding, barrel racing, and trick riding. But buy tickets early since it’s popular with the locals. Not the horsey type? They also have a 9-hole golf course and a driving range, or you can take advantage of the ranch’s location on picturesque Kissimmee River and go swimming, fishing, canoeing, or try an airboat ride. Accommodations offer something at every price: from timeshare villas to motel-type rooms, to cabins, to campsites. ***To help plan your getaway, a perfect starting point is Polk Outpost 27– Central Florida’s interactive visitor center. Watching the brief virtual-balloon-ride film will give you a birds-eye view of the many attractions and activities that Polk County offers. Then talk to one of their knowledgeable concierges-mine was oozing southern charm and hospitality- who will answer questions and work with you to organize your whole stay, even making lodging or dinner reservations. Be sure and ask for their cost-saving brochure, Free Passport to Adventure and Savings. Open daily on Hwy 27 by exit 55. So if you’ve done the Disney Amusment Park thing to death and can’t face the thought spending hours in endless lines of screaming kids…have I got a secret to share with you!